It’s easy to imagine the excitement NASA personnel must have felt when an amateur astronomer contacted NASA to tell them that he might have found their missing IMAGE satellite. After all, the satellite had been missing for 10 years. IMAGE, which stands for Imager for Magnetopause-to-Aurora Global Exploration, was launched on March 25th, 2000. In Dec. 2005 the satellite failed to make routine contact, and in 2007 it failed to reboot. After that, the mission was declared over. After Tilly contacted NASA, they hurried to confirm that it was indeed IMAGE that had been found. To do that, NASA employed 5 separate antennae to seek out any radio signals from the satellite. As of Monday, Jan. 29, signals received from all five sites were consistent with the radio frequency characteristics expected of IMAGE. Then, on January 30, the Johns Hopkins Applied Physics Lab (JHUAPL) reported that they had successfully collected telemetry data from the satellite. In that signal was the ID code 166, the code for IMAGE. There were probably some pretty happy people at NASA. NASA’s next step is to confirm without a doubt that this is indeed IMAGE. That means capturing and analyzing the data in the signal. That will be a technical challenge, because the types of hardware and operating systems used in the IMAGE Mission Operations Center no longer exist. According to NASA, “other systems have been updated several versions beyond what they were at the time, requiring significant reverse-engineering.” But that should be no problem for NASA. After all, they got Apollo 13 home safely, didn’t they? If NASA is successful at decoding the data in the signal, the next step is to attempt to turn on IMAGE’s science payload. NASA has yet to decide how to proceed if they’re successful. IMAGE was the first spacecraft designed to “see the invisible,” as they put it back then. Prior to IMAGE, spacecraft examined Earth’s magnetosphere by detecting particles and fields they encountered as they passed through them. But this method had limited success. The magnetosphere is enormous, and simply sampling a small path—while better than nothing—did not give us an accurate understanding of it. These instruments allowed IMAGE to not only do great science, and to capture great images, but also to create some stunning never-seen-before movies of auroral activity. This is a fascinating story, and it’ll be interesting to see if NASA can establish meaningful contact with IMAGE. Will it have a treasure trove of unexplored data on-board? Can it be re-booted and brought back into service? We’ll have to wait and see. This story is also interesting culturally. IMAGE was in service at a time when the internet wasn’t as refined as it is currently. NASA has mastered the internet and public communications now, but back then? Not so much. For example, to build up interest around the mission, NASA gave IMAGE its own theme song, titled “To See The Invisible.” Yes, seriously. But that’s just a side-note. IMAGE was all about great science, and it accomplished a lot. You can read all about IMAGE’s science achievements here. Orbital debris (aka. space junk) is one of the greatest problems facing space agencies today. After sixty years of sending rockets, boosters and satellites into space, the situation in the Low Earth Orbit (LEO) has become rather crowded. Given how fast debris in orbit can travel, even the tiniest bits of junk can pose a major threat to the International Space Station and threaten still-active satellites. It’s little wonder then why ever major space agency on the planet is committed to monitoring orbital debris and creating countermeasures for it. 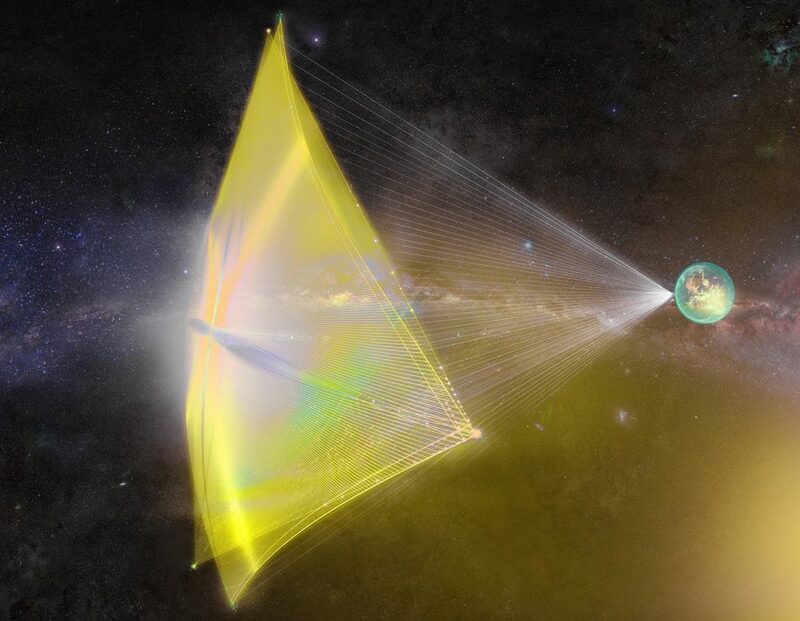 So far, proposals have ranged from giant magnets and nets and harpoons to lasers. Given their growing presence in space, China is also considering developing giant space-based lasers as a possible means for combating junk in orbit. One such proposal was made as part of a study titled “Impacts of orbital elements of space-based laser station on small scale space debris removal“, which recently appeared in the scientific journal Optik. The study was led by Quan Wen, a researcher from the Information and Navigation College at China’s Air Force Engineering University, with the help of the Institute of China Electronic Equipment System Engineering Company. This is not the first time that directed-energy has been considered as a possible means of removing space debris. However, the fact that China is investigating directed-energy for the sake of debris removal is an indication of the nation’s growing presence in space. It also seems appropriate since China is considered to be one of the worst offenders when to comes to producing space junk. Back in 2007, China conducted a anti-satellite missile test that resulted in the creation over 3000 of bits of dangerous debris. This debris cloud was the largest ever tracked, and caused significant damage to a Russian satellite in 2013. Much of this debris will remain in orbit for decades, posing a significant threat to satellites, the ISS and other objects in LEO. Such concerns are quite common, and represent a bit of a stumbling block when it comes to the use of directed-energy platforms in space. While orbital lasers would be immune to atmospheric interference, thus making them much more effective at removing space debris, they would also lead to fears that these lasers could be turned towards enemy satellites or stations in the event of war. As always, space is subject to the politics of Earth. At the same time, it also presents opportunities for cooperation and mutual assistance. And since space debris represents a common problem and threatens any and all plans for the exploration of space and the colonization of LEO, cooperative efforts to address it are not only desirable but necessary. Have you noticed that weather forecasting has gotten much better in the last few years? Thanks to weather satellites, weather stations, and better forecasting techniques. How do scientists predict the weather with any kind of accuracy days or even weeks in the future. What’s the weather doing? Is it going to rain today? How much? What about temperatures? We depend on modern weather forecasting, thanks, in part to the vast network of weather satellites. What instruments do they have, what orbits do they use. When it comes to the future of space exploration, some truly interesting concepts are being developed. Hoping to reach farther and reduce associated costs, one of the overarching goals is to find more fuel-efficient and effective means of sending robotic spacecraft, satellites and even crewed missions to their destinations. Towards this end, ideas like nuclear propulsion, ion engines and even antimatter are all being considered. But this idea has to be the strangest one to date! It’s known as a ferrofluid thruster, a new concept that relies on ionic fluids that become strongly magnetized and release ions when exposed to a magnetic field. According to a new study produced by researchers from the Ion Space Propulsion Laboratory at Michigan Tech, this concept could very well be the future of satellite propulsion. This study, which was recently published in the journal Physics of Fluids, presents an entirely new method for creating microthrusters – tiny nozzles that are used by small satellites to maneuver in orbit. Thanks to improvements in technology, small satellites – which are typically defined as those that weight less than 500 km (1,100 lbs) – can perform tasks that were once reserved for larger ones. As such, they are making up an increasingly large share of the satellite market, and many more are expected to be launched in the near future. In fact, it is estimated that between 2015 and 2019, over 500 small satellites will be launched to LEO, with an estimated market value of $7.4 billion. Little wonder then why researchers are looking at various types of microthrusters to ensure that these satellites can maneuver effectively. While there are no shortage of possibilities, finding the one that balances cost-effectiveness and reliability has been difficult. To address this, an MTU research team began conducting a study that considered ferrofluids as a possible solution. As noted, ferrofluids are ionic liquids that become active when exposed to a magnetic field, forming peaks that emit small amounts of ions. These peaks then return to a natural state when the magnetic field is removed, a phenomena known as Rosenweig instability. Led by Brandon A. Jackson – a doctoral candidate in mechanical engineering at Michigan Technological University – the MTU research team began to consider how this could be turned into propulsion. Other members included fellow doctoral candidate Kurt Terhune and Professor Lyon B. King. Prof. King, the Ron & Elaine Starr Professor in Space Systems at Michigan Tech, has been researching the physics of ferrofluids for many years, thanks to support provided by the Air Force Office of Scientific Research (AFOSR). In 2012, he proposed using such ionic fluids to create a microthruster for modern satellites, based on previous studies conducted by researchers at the University of Sydney. With King’s help, who oversees MTU’s Ion Space Propulsion Laboratory, Jackson and Tehrune began conducting an an experimental and computational study on the dynamics of the ferrofluid. From this, they created a computational model that taught them much about the relationships between magnetic, electric and surface tension stresses, and were even surprised by some of what they saw. Ultimately, what they had created was a model for an electrospray ionic liquid ferrofluid thruster. Unlike conventional electrospray thrusters – which generate propulsion with electrical charges that send tiny jets of fluid through microscopic needles – a ferrofluid electrospray thruster would be able to do away with these needles, which are expensive to manufacture and vulnerable to damage. Instead, the thruster they are proposing would be able to assemble itself out of its own propellant, would rely on no fragile parts, and would essentially be indestructible. It would also present advantages over conventional plasma thrusters, which are apparently unreliable when scaled down for small satellites. With the success of their model, the AFOSR recently decided to award King a second contract to continue studying ferrofluids. Looking ahead, the team wants to conduct experiments on how an actual thruster might perform. The team has also begun working with Professor Juan Fernandez de la Mora of Yale University, one of the world’s leading experts on electrospray propulsion, to help bring their proposal to fruition. Naturally, it will take many years before a prototype is ready, and such a thruster would likely have to be able to execute about 100 peaks to be considered viable. Nevertheless, the technology holds promise for a market that is expected to grow by leaps and bounds in the coming years and decades. Facilitating everything from worldwide internet access and telecommunications to scientific research, there is likely to be no shortage of smallsats, cubesats, nanosats, etc. taking to space very soon. They will all need to have reliable propulsion if they want to be able to stay clear of each other do their jobs! Michigan Tech also has patents pending for the technology, which has applications that go beyond propulsion to include spectrometry, pharmaceuticals, and nanofabrication. NASA strives to explore space and to expand our understanding of our Solar System and beyond. But they also turn their keen eyes on Earth in an effort to understand how our planet is doing. Now, they’re releasing a new composite image of Earth at night, the first one since 2012. We’ve grown accustomed to seeing these types of images in our social media feeds, especially night-time views of Earth from the International Space Station. But this new image is much more than that. It’s part of a whole project that will allow scientists—and the rest of us—to study Earth at night in unprecedented detail. Night-time views of Earth have been around for 25 years or so, usually produced several years apart. Comparing those images shows clearly how humans are changing the face of the planet. Scientists have been refining the imaging over the years, producing better and more detailed images. The team behind this is led by Miguel Román of NASA’s Goddard Space Flight Center. They’ve been analyzing data and working on new software and algorithms to improve the quality, clarity, and availability of the images. This new work stems from a collaboration between the National Oceanic and Atmospheric Administration (NOAA) and NASA. In 2011, NASA and NOAA launched a satellite called the Suomi National Polar-orbiting Partnership (NPP) satellite. The key instrument on that satellite is the Visible Infrared Imaging Radiometer Suite (VIIRS), a 275 kg piece of equipment that is a big step forward in Earth observation. VIIRS detects photons of light in 22 different wavelengths. It’s the first satellite instrument to make quantitative measurements of light emissions and reflections, which allows researchers to distinguish the intensity, types and the sources of night lights over several years. Composite image of Mid-Atlantic and Northeastern U.S. at night, 2016. Producing these types of maps is challenging. The raw data from SUOMI NPP and its VIIRS instrument has to be skillfully manipulated to get these images. The main challenge is the Moon itself. As the Moon goes through its different phases, the amount of light hitting Earth is constantly changing. Those changes are predictable, but they still have to be accounted for. Other factors have to be managed as well, like seasonal vegetation, clouds, aerosols, and snow and ice cover. Other changes in the atmosphere, though faint, also affect the outcome. Phenomenon like auroras change the way that light is observed in different parts of the world. The newly released maps were made from data throughout the year, and the team developed algorithms and code that picked the clearest night views each month, ultimately combining moonlight-free and moonlight-corrected data. The SUOMI NPP satellite is in a polar orbit, and it observes the planet in vertical swaths that are about 3,000 km wide. With its VIIRS instrument, it images almost every location on the surface of the Earth, every day. VIIRS low-light sensor has six times better spatial resolution for distinguishing night lights, and 250 times better resolution overall than previous satellites. What do all those numbers mean? The team hopes that their new techniques, combined with the power of VIIRS, will create images with extraordinary resolution: the ability to distinguish a single highway lamp, or fishing boat, anywhere on the surface of Earth. Composite image of Nile River and surrounding region at night, 2016. Beyond thought-provoking eye-candy for the rest of us, these images of night-time Earth have practical benefits to researchers and planners. These three composite images provide full-hemisphere views of Earth at night. The clouds and sun glint — added here for aesthetic effect — are derived from MODIS instrument land surface and cloud cover products. These maps of night-time Earth are a powerful tool. But the newest development will be a game-changer: Román and his team aim to provide daily, high-definition views of Earth at night. Daily updates will allow real-time tracking of changes on Earth’s surface in a way never before possible. Maybe the best thing about these upcoming daily night-time light maps is that they will be publicly available. The SUOMI NPP satellite is not military and its data is not classified in any way. They hope to have these daily images available later this year. Once the new daily light-maps of Earth are available, it’ll be another powerful tool in the hands of researchers and planners, and the rest of us. These maps will join other endeavours like NASA-EOSDIS Worldview. Worldview is a fascinating, easy-to-use data tool that anyone can access. It allows users to look at satellite images of the Earth with user-selected layers for things like dust, smoke, draught, fires, and storms. It’s a powerful tool that can change how you understand the world. We’re accustomed to the ‘large craft’ approach to exploring our Solar System. Probes like the Voyagers, the Mariners, and the Pioneers have written their place in the history of space exploration. Missions like Cassini and Juno are carrying on that work. But advances in technology mean that Nanosats and Cubesats might write the next chapter in the exploration of our Solar System. Nanosats and Cubesats are different than the probes of the past. They’re much smaller and cheaper, and they offer some flexibility in our approach to exploring the Solar System. A Nanosat is defined as a satellite with a mass between 1 and 10 kg. A CubeSat is made up of multiple cubes of roughly 10cm³ (10cm x 10cm x 11.35cm). Together, they hold the promise of rapidly expanding our understanding of the Solar System in a much more flexible way. NASA has been working on smaller satellites for a few years, and the work is starting to bear some serious fruit. A group of scientists at JPL predicts that by 2020 there will be 10 deep space CubeSats exploring our Solar System, and by 2030 there will be 100 of them. NASA, as usual, is developing NanoSat and CubeSat technologies, but so are private companies like Scotland’s Clyde Space. Clyde Space from Clyde Space on Vimeo. NASA has built 2 Interplanetary NanoSpacecraft Pathfinder In Relevant Environment (INSPIRE) CubeSats to be launched in 2017. They will demonstrate what NASA calls the “revolutionary capability of deep space CubeSats.” They’ll be placed in earth-escape orbit to show that they can withstand the rigors of space, and can operate, navigate, and communicate effectively. Following in INSPIRE’s footsteps will be the Mars Cube One (MarCO) CubeSats. MarCO will demonstrate one of the most attractive aspects of CubeSats and NanoSats: their ability to hitch a ride with larger missions and to augment the capabilities of those missions. In 2018, NASA plans to send a stationary lander to Mars, called Interior Exploration using Seismic Investigations, Geodesy and Heat Transport (InSight). The MarCO CubeSats will be along for the ride, and will act as communications relays, though they aren’t needed for mission success. They will be the first CubeSats to be sent into deep space. So what are some specific targets for this new class of small probes? The applications for NanoSats and CubeSats are abundant. NASA’s Europa Clipper Mission, planned for the 2020’s, will likely have CubeSats along for the ride as it scrutinizes Europa for conditions favorable for life. NASA has contracted 10 academic institutes to study CubeSats that would allow the mission to get closer to Europa’s frozen surface. The ESA’s AIM asteroid probe will launch in 2020 to study a binary asteroid system called the Didymos system. AIM will consist of the main spacecraft, a small lander, and at least two CubeSats. The CubeSats will act as part of a deep space communications network. The challenging environment of Venus is also another world where CubeSats and NanoSats can play a prominent role. Many missions make use of a gravity assist from Venus as they head to their main objective. The small size of NanoSats means that one or more of them could be released at Venus. The thick atmosphere at Venus gives us a chance to demonstrate aerocapture and to place NanoSats in orbit around our neighbor planet. These NanoSats could take study the Venusian atmosphere and send the results back to Earth. But the proposed NanoSWARM might be the most effective demonstration of the power of NanoSats yet. The NanoSWARM mission would have a fleet of small satellites sent to the Moon with a specific set of objectives. Unlike other missions, where NanoSats and CubeSats would be part of a mission centered around larger payloads, NanoSWARM would be only small satellites. NanoSWARM is a forward thinking mission that is so far only a concept. It would be a fleet of CubeSats orbiting the Moon and addressing questions around planetary magnetism, surface water on airless bodies, space weathering, and the physics of small-scale magnetospheres. NanoSWARM would target features on the Moon called “swirls“, which are high-albedo features correlated with strong magnetic fields and low surficial water. NanoSWARM CubeSats will make the first near-surface measurements of solar wind flux and magnetic fields at swirls. This is an image of the Reiner Gamma lunar swirl from NASA’s Lunar Reconnaissance Orbiter. NanoSWARM would have a mission architecture referred to as “mother with many children.” The mother ship would release two sets of CubeSats. One set would be released with impact trajectories and would gather data on magnetism and proton fluxes right up until impact. A second set would orbit the Moon to measure neutron fluxes. NanoSWARM’s results would tell us a lot about the geophysics, volatile distribution, and plasma physics of other bodies, including terrestrial planets and asteroids. Space enthusiasts know that the Voyager probes had less computing power than our mobile phones. It’s common knowledge that our electronics are getting smaller and smaller. We’re also getting better at all the other technologies necessary for CubeSats and NanoSats, like batteries, solar arrays, and electrospray thrusters. As this trend continues, expect nanosatellites and cubesats to play a larger and more prominent role in space exploration. And get ready for the NanoSTORM. While the Great Wall of China is not readily visible from space (we debunked that popular myth here) there are several other human-built structures that actually can be seen from space. And that list is growing, thanks to the large solar farms being built around the world. The solar farm with the current distinction of being the largest in the world — as of February 2017 – is the Longyangxia Dam Solar Park in China. These new images from NASA’s Landsat 8 satellite show the farm’s blue solar panels prominently standing out on the brown landscape of the western province of Qinghai, China. Reportedly, the solar farm covers 27 square kilometers (10.42 square miles), and consists of nearly 4 million solar panels. You can see in the image below from 2013 that the farm has been growing over the years. The project has cost the amount of 6 billion yuan ($889.5 million). of the Longyangxia Dam Solar Park in China. Credit: NASA/Landsat 8. China wants to shed its title of the biggest polluter in the world and is now investing in clean, renewable energy. It has a goal of producing 110 GW of solar power and 210 GW of wind power by the year 2020. That sounds like a lot, but in a country of 1.4 billion people that relies heavily on coal, it amounts to less than 1 percent of the country’s more than 1,500 gigawatts of total power generation capacity, says Inside Climate News. According to NASA, China is now the world’s largest producer of solar power, however Germany, Japan, and the United States produce more solar power per person. China has another solar farm in the works that will have a capacity of 2,000 MW when it is finished. Here’s another wider-angle view from Landsat 8 of the Longyangxia Dam and lake near the solar farm. The Longyangxia Dam Solar Park as seen from orbit on January 5, 2017. Credit: NASA/Landsat 8.